Memorial Day Cookout Menu Now Ready for Members! 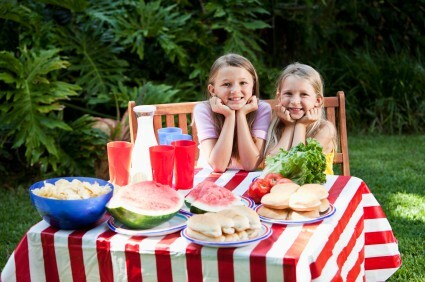 Memorial Day Weekend is upon us and for many of us, that means attending or hosting those long awaited summer-themed cookouts! Although it might not feel like the start of summer for all of us (we are still waiting for the warm weather here in New England), there is something about getting the barbecue going and easy summer fare that makes us feel like summer time has finally arrived! If you are a member of The Dinner Daily, we just added our ready-to-go Memorial Day Cookout menu, complete with an organized shopping list, in the Dinner Party Plans section at the bottom of your Dashboard. This pre-planned menu includes 2 mains, 4 healthy and delicious summer salads, and a very easy dessert and is designed to feed 10. So, if planning a gathering is not your thing or you are just too busy to pull it all together, just log in and get our easy cookout menu and shopping list. If you’re not hosting but just need some new ideas for a side or dessert to bring along, you will also find some good ideas on the menu. Just log into your account to get the plan. Not a member yet? That is easy too. You can sign up HERE and not only get our ready to go cookout menu, but also try out our award winning service designed to get easy dinners on the table quickly and easily, and entirely customized for your local store specials for 2 weeks free of charge! The cookout menu will found by clicking on the “Dinner Party Plans” icon, located towards the bottom of your Dashboard upon log in. What’s on the menu specifically? Glad you asked! Wishing you all a happy and safe Memorial Day Weekend!